While in LUSH the other month, I hadn't noticed I picked up the self-preserving Ocean Salt. The woman at the counter pointed this out to me and I said hey, it's worth a try, how much different could it be to the original Ocean Salt? There were a few things that straight away I noticed were different. Those were the things for me I couldn't get passed, it's hard not to compare two products that are 'the same'. I find the smell is more subtle with the self-preserving and while using it, it gave me a whiff of their Oatifix face mask. The strong smell is one of the reason I adore the original. I think my pot didn't have as much Lime Soaked in Vodka. Self-preserving is less gritty than original. I think it would be suitable for those whose skin is more sensitive prone as it wouldn't be as irritating. I have noticed a lot of people say that the salt is too harsh for their skin and it scratches, I've never experienced this, which is why it's been a HG of mine for about 4/5 years. I also find the self-preserving more solid. The self-preserving ocean salt doesn't have as much ingredients as it's original. They've removed Stearic Acid, Glycol Cetearate, Triethanolamine, Lanolin, Cetearyl Alcohol, Methylparaben and Propylparaben and isn't Vegan suitable. It's added Silken Tofu, Japan Wax and Mango Butter and became suitable for Vegans thanks to the removal of Lanolin. Lanolin is a waxy residue that comes from the skin secretions of sheep. It's often used within cosmetics to help bind ingredients while giving them an oily consistancy and heal & soothe the skin. Of course they've got rid of the parabens, the love / hate bens. Ask industry professionals and they will tell you for years they've been used safely within products but some people might have a reaction to them, although a vast majority of people may say they have links to encouraging cancer cells. It's debated and a when in doubt, do without ingredient. LUSH have listened and given different ingredients to suit their customers. That being said, I'm still unsure, maybe it was my pot? 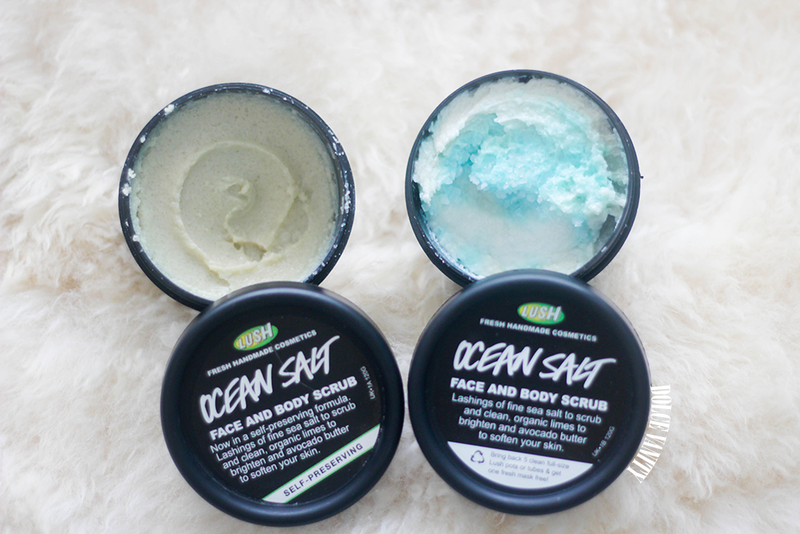 I hadn't used the scrub since the second use, I just reverted back to my St Ives Scrub and then purchased the original Ocean Salt instead. I'm actually interested in trying this. I'm really afraid of using Ocean Salt on my sensitive skin so maybe this would be better. I also felt like the self preserving leaves kind of an oily feeling on my face which I do not love. Original all the way!! I agree, got to be the original all the way!! I try to never purchase the self preserving while in a rush lol.